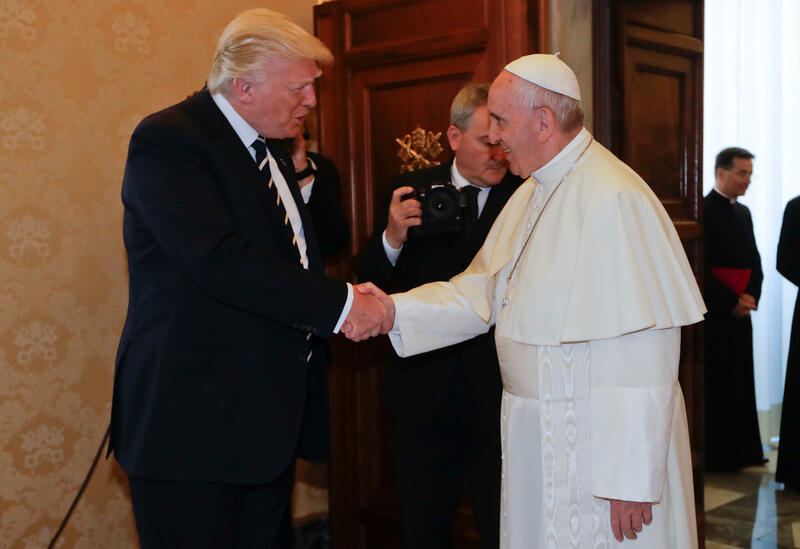 VATICAN CITY -- President Donald Trump has met Pope Francis, the famously humble pontiff with whom he has publicly clashed, concluding his tour of the ancestral homes of the world's three largest monotheistic religions. Mr. Trump, midway through his grueling nine-day maiden international journey, called upon the pontiff at the Vatican early Wednesday where the two had a private 30-minute meeting laden with religious symbolism and ancient protocol. The president, accompanied by his wife and several aides, arrived at the Vatican just after 8 a.m. local time. The president greeted Francis in Sala del Tronetto, the room of the little throne, on the second floor of Apostolic Palace Wednesday morning. The men shook hands and Mr. Trump could be heard thanking the pope and saying it was "a great honor" to be there. They posed for photographs and then sat down at the papal desk, the pope unsmiling, as their private meeting began. It ended a half hour later when Francis rang the bell in his private study. The pontiff was then introduced to members of Mr. Trump's delegation, including his wife Melania, his daughter Ivanka and son-in-law Jared Kushner, as well as aides Hope Hicks and Dan Scavino. As is tradition, the pope and president then exchanged gifts. Mr. Trump later told Italian Prime Minister Paolo Gentiloni that his meeting with the Pope was "fantastic" adding, "He is something. He is really great." The meeting could provide powerful imagery to Catholic voters back in the United States as well as the possibility for conflict between a president and a pope who have not often seen eye-to-eye. The two men's often opposite worldviews collided head-on early last year, when Francis was sharply critical of Mr. Trump's campaign pledge to build an impenetrable wall on the Mexican border and his declaration that the United States should turn away Muslim immigrants and refugees. "A person who thinks only about building walls, wherever they may be, and not building bridges, is not Christian," Francis said then. The pontiff has been a vocal advocate for aiding refugees, particularly those fleeing the violence in Syria, deeming it both a "moral imperative" and "Christian duty" to help. Donald Trump: Pope Francis questioning my faith is "disgraceful"
President Trump has never been one to let an insult, perceived or real, go by without a response, and he made no exception for the world's best-known religious leader. He called Francis "disgraceful" for doubting his faith. And even the pontiff's congratulatory message sent to mark Mr. Trump's inauguration contained a sly reference to their disagreement, as the pope wrote that he hoped the United States' international stature would "continue to be measured above all by its concern for the poor, the outcast and those in need." Mr. Trump arrived in Rome Tuesday evening, his motorcade closing a busy Italian highway just after rush hour and prompting hundreds of onlookers to briefly step out of their gridlocked cars to gawk at the fleet of armored vehicles. He spent the night at the U.S. ambassador to Italy's residence. Though both Mr. Trump and Francis are known for their unpredictability, papal visits with heads of state are carefully arranged bits of political and religious theater that follow a specific program, with little room for deviation or unwanted surprises. The president was expected to be given a tour of the Vatican after he arrived and then meet with the pontiff in his library. The two men were to be left alone with a translator to hold a private discussion before emerging again to exchange gifts and farewells. Mr. Trump was the 13th president to visit the Vatican and, as part of his tour, he viewed the Sistine Chapel. In recent days, Francis and Mr. Trump have been in agreement on a need for Muslim leaders to do more against extremists in their own communities. But there are few other areas where their views align. Following his meeting with the Pope on Wednesday however, Mr. Trump tweeted after having the "honor of a lifetime" he left the Vatican more determined than ever to pursue peace." The president's prior anti-Muslim rhetoric -- including his musing that Islam "hates" the West -- is the antithesis of what the pope has been preaching about a need for dialogue with Muslims. Francis also differs sharply with Mr. Trump on the need to combat climate change and economic inequality, a point he quietly made during their visit. The pope gave the president a copy of his famous 2015 letter on the environment and sustainable development. The letter marked the first time a pope has made such a public call for environmental care and climate change awareness. Mr. Trump's visit to the Eternal City came after two stops in the Middle East where he visited the cradles of Islam and Judaism. In Saudi Arabia, he addressed dozens of Arab leaders and urged them to fight extremists at home and isolate Iran, which he depicted as a menace to the region. In Israel, Mr. Trump reaffirmed his commitment to strong ties with the nation's longtime ally and urged both the Israelis and the Palestinians to begin the process of reaching a peace deal. No details or timetable have yet to be established for negotiations. But while President Trump received extravagantly warm welcomes in Riyadh and Jerusalem, the reception could grow much cooler now that he's reached Europe, where there were widespread protests after his election. Climate change activists projected the words "Planet Earth First" on the massive dome of St. Peter's Basilica at the Vatican on Tuesday night, and protests are expected Wednesday in Rome and later in the week during Mr. Trump's visit to Brussels for a NATO meeting and to Sicily for a G7 gathering.